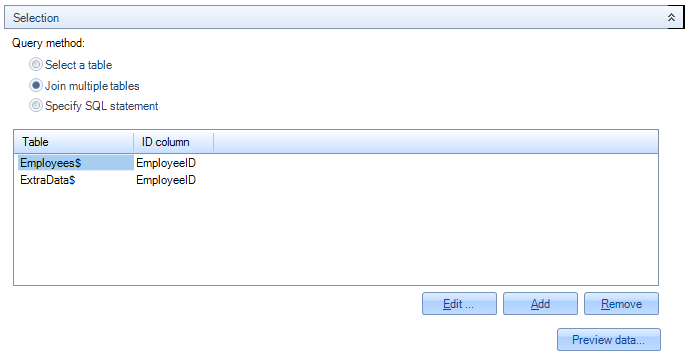 The MySQL data source selects data from a database in a MySQL server. A standard connection string used to identify the MySQL server, the database and authentication. Databases in a MySQL server can contain multiple tables. You can access these tables directly by selecting Select a table as the query method, and selecting the table from the drop down list. Using the 'Join multiple tables' query method you can combine data from multiple tables in the same database. Most data sources are organized as tables. You can select data from multiple tables at once using this by selecting the option Join multiple tables and selecting the appropriate tables from the drop down list. See below. For each selected table, you must specify the name of the table and the ID column. The ID column is use to match rows in all tables. Using the MySQL data source is only possible after installing the MySQL database driver. Download the MySQL Connector/NET (version 5.2 or higher) from http://dev.mysql.com/downloads/connector/net/. Choose the Windows Binaries, no installer (ZIP) option. Unpack the downloaded ZIP file into a temporary folder. Copy MySql.Data.dll (located in the bin folder in the temporary folder) to the base folder located under the variaDoc program files folder. This is C;\Program Files(x86)\VariaDoc 6 by default. If you're using the variaDoc Web service, Command line application or Reports assembly, re-deploy it using the Server Deployment Wizard.